I love a good trail mix. They are perfect for those hunger pangs at 4 pm or to satisfy your on-the-go cravings. My homemade trail mix recipe has super healthy ingredients. So you can munch a handful without guilt. Your kids will love it too. It has no artificial sweeteners. 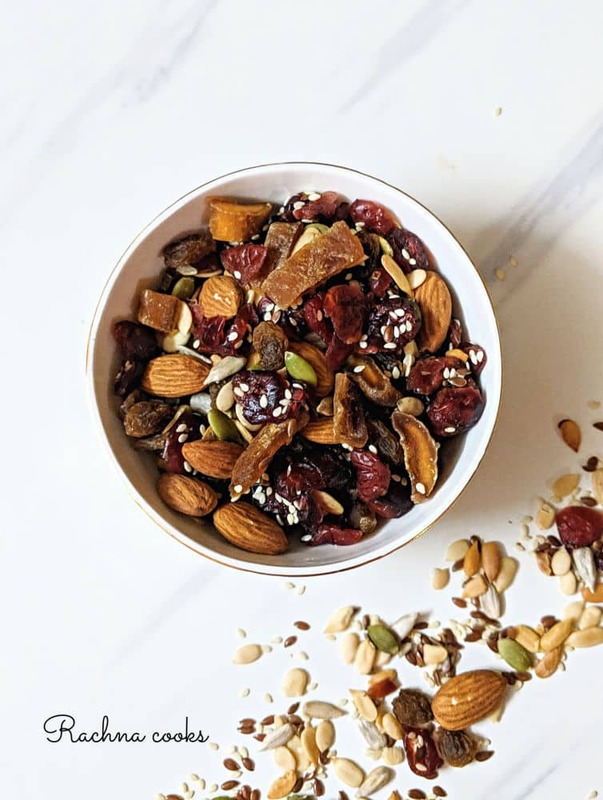 The trail mix ingredients have a mix of nuts, berries and seeds and is bursting with nutrition. 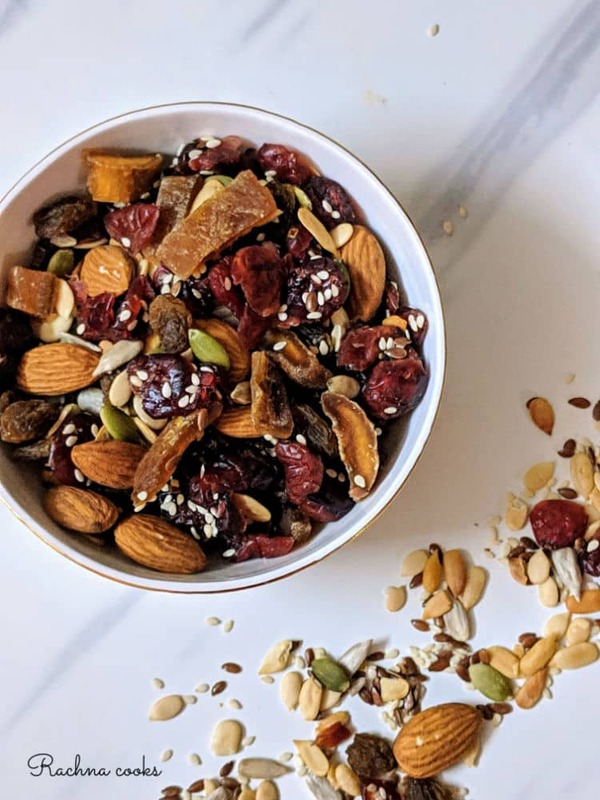 You can make this healthy trail mix and store in an airtight jar for 2 weeks though it won’t last that long, I assure you. 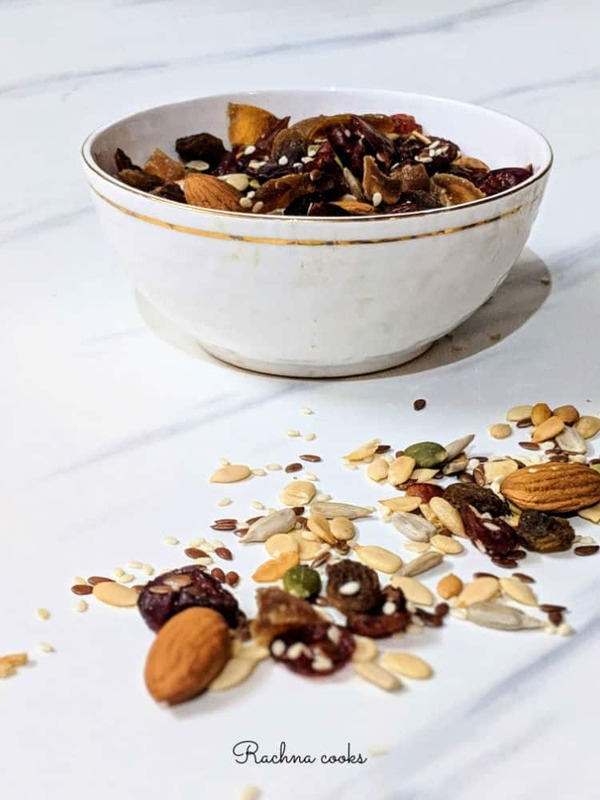 This is a super simple and healthy trail mix recipe that uses lots of raw foods like nuts and seeds. No added sugar. This is the perfect snack to have. It is kid approved too. I used a combination of raw almonds and cashews. You could roast them if you so like. I did not toast the seeds, but again feel free to lightly toast them. Chop any large ingredients into smaller pieces like I did for mango pieces that added a nice sweet-sour touch to the mix. 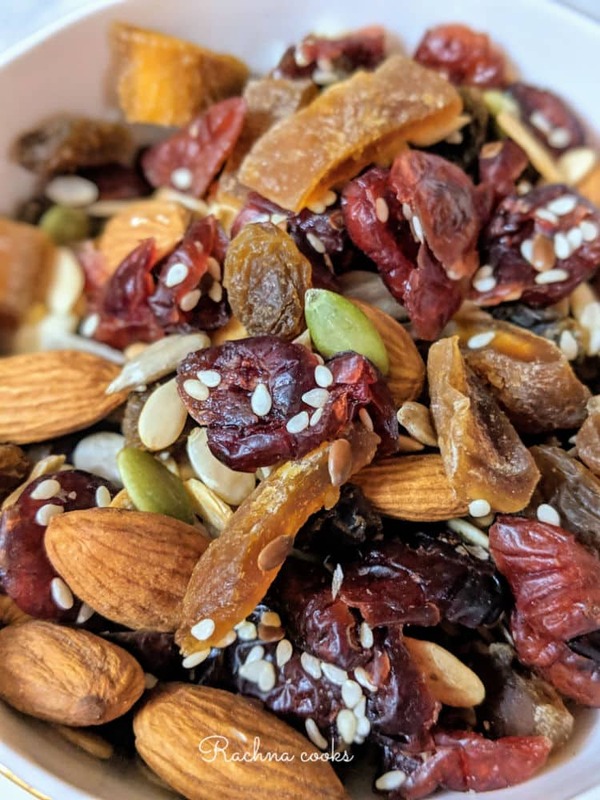 Cranberries and raisins naturally sweeten the trail mix. 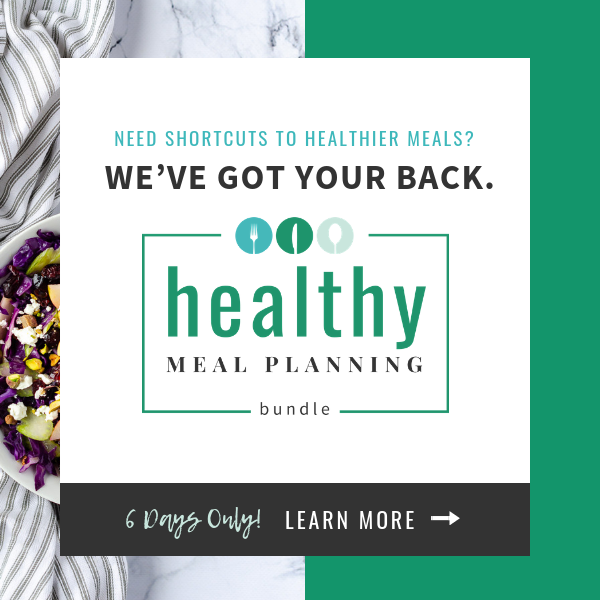 You could use dates as well. I did not use chocolate chips this time, but they are a good indulgence to add. Mix everything together. I did not add any added sugar or salt. Have a large handful and enjoy your homemade delicious trail mix. Store in an airtight jar so that they stay fresh. Chop the raisins or cranberries so that they stick to the seeds better. You can use any combination of nuts and seeds, just keep the proportion of nuts, seeds and dried fruits and berries 2:1:1. You can skip chocolate chips but they do add to the taste. As you can see, it is really simple to make your own trail mix. Hence you don’t really need to buy fancy and expensive trail mixes off the shelves. They are loaded with excessive sweeteners and salt. 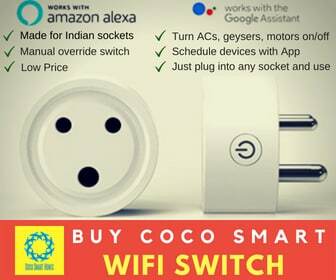 Besides it is economical to do so and not time consuming at all. The best part this trail mix is kid approved. Imagine a healthy snack that your kids like. So go ahead and try it. Try this easy Chocolate Peanut Butter Fudge for a delightful sweet fix this Valentine’s Day. Trail mix is always something I keep in handy for my hunger pangs. I have always bought it until now, I almost feel stupid that it is so easy to make. I will be making this today evening! Yes, rightaway! Something to be tried out right away..
Rachna, this is one recipe I am going to try ASAP! Heading to the store tomorrow. Will pick up all the ingredients. Something I can munch on, guilt free! What’s not to love. Also, question, can I have this along with oats/cornflakes and cold milk as a cereal? You can have a handful along with your breakfast. Sure, it is a power packed way of adding more nutrition to plain cornflakes or oats. Will definitely make this Rachana. 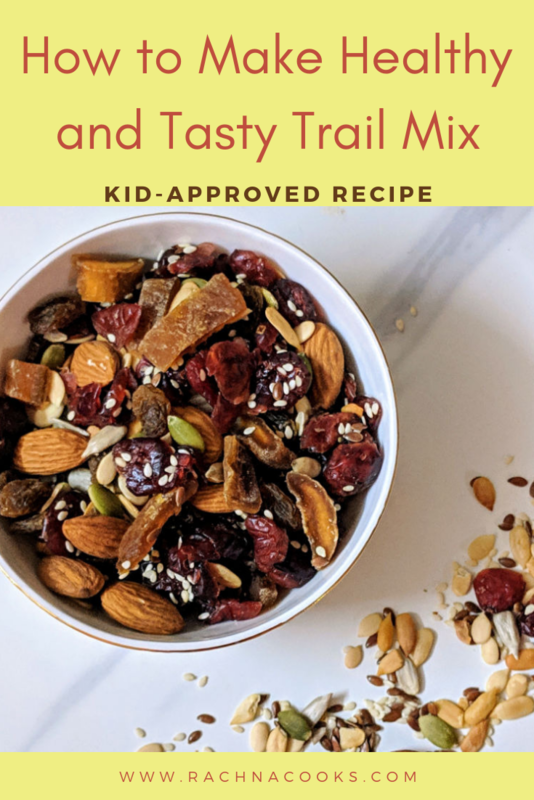 I don’t particularly go for nuts but my daughter is nuts about trail mixes.